Do you want to learn about the best web analytics tools? There are several free options available of which the king is Google Analytics. There is no reason not to use it. And then there’s Crazy Egg, which offers deeper insight with rich visual analytics and heatmaps. See how to implement the most recommended successful web analytics strategies with these tools and improve your traffic and conversions! 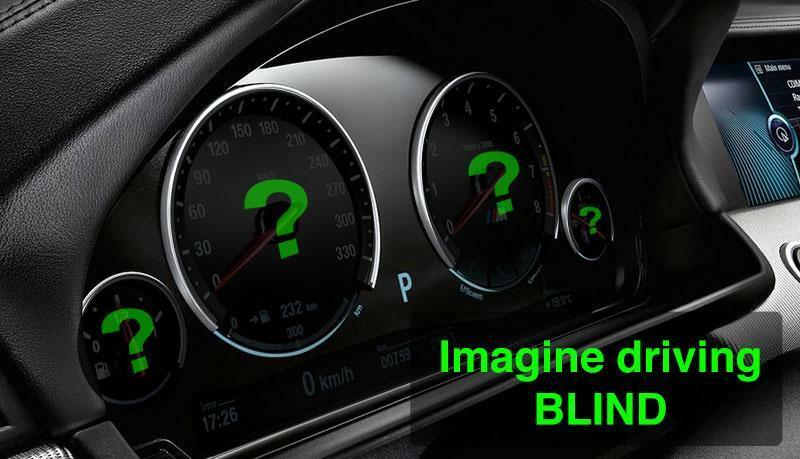 Can you imagine driving a car without a speedometer, tachometer, odometer, fuel gauge, or system indicators? Imagine having to eyeball your speed as you drive, while remembering to refuel every 200 miles just to make sure you don’t run out of gas. Oops, I forgot, there’s no odometer, so you don’t even know how many miles you’ve driven since the last trip. (This must be a Model T.) And with no system indicators, you’d soon surely be left with a smoldering hunk of steel if you weren’t careful. Unfortunately, a vast number of businesses either don’t use web analytics at all, or exclusively rely on Google Analytics without even knowing how to use it to its fullest potential, while lacking the valuable and varied insight from all the other great web analytics tools in the market. In fact, 62% of businesses have no data analytics strategy. If you lack a strong web analytics strategy, you are driving your business blind. Simply put, web analytics tell you how many visitors are coming to your website, where they came from, how many of them are unique visitors, how long they stay on your page, what other pages they visit, what percentage of them purchase or subscribe, where on your page they are clicking, where they are failing to click, what section of your page they were on before exiting, and hundreds of other data points. Here are some of the best metrics your business should measure. What Goals Can Be Achieved Using Web Analytics? The most important goal for businesses to achieve, in general, is to increase conversions. Put simply, a conversion is any action that your visitor or customer takes on your website that signifies success. Usually these are purchases from an online store, or sig-ups to an email newsletter. Web analytics can quickly tell you exactly what percentage of your total daily, weekly, or monthly visitors converted. With web analytics, you can easily track the number of visitors to your home page and the number who reaches your “thank you” page, shown after every purchase. If you have 3,000 monthly visitors but less than 30 sales, you are probably below average. With further research into your specific niche or industry you can verify this. Check out some typical conversion rates by industry and by country. At this point, how can web analytics actually help you increase your conversions, instead of simply informing you of how badly your site is performing? One way could be to use heat maps, another type of web analytics, and Crazy Egg’s signature web analytics tool. 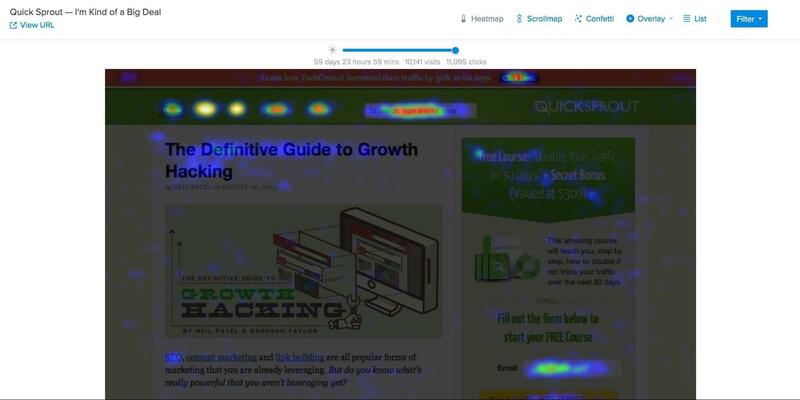 With a heat map, you can see exactly where your visitors are clicking by looking at colored overlays placed on top of your web pages. The red and white zones are the hotspots where most people are clicking. For a simple example of this in action, imagine you had a “Buy Now” button (or CTA: “Call to Action”) that was the only path to purchasing a product. If this button wasn’t right underneath a nice, hot white spot surrounded by red, you would then know that not enough people are clicking this button. Armed with this knowledge, you can determine that your CTA is badly designed, hard to see, or hard to click on. If you made your CTA bigger and brighter as a result of your web analytics data, and thus enjoyed a higher conversion rate (more sales, more profit), then web analytics tools definitely caused you to achieve your goal. Although less common, other goals can be reached with web analytics tools as well. Although technically every single desired behavior you want your visitors to take can be called a conversion, some behaviors may not directly result in profit. You may simply want more people to scroll down to the bottom of a page. More people reaching the bottom of a long page of copy might simply signify that the quality of your writing is improving because more people are reading the whole thing. In this case, the behavior is scrolling down, and the conversion is scrolling all the way to the bottom. 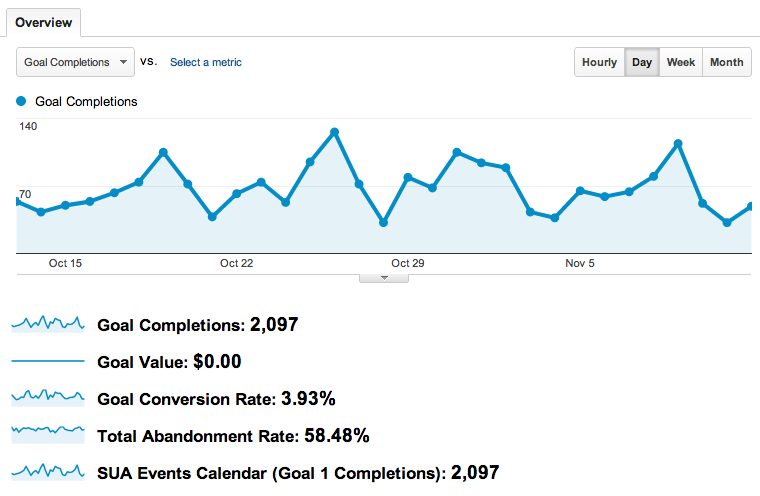 If a blog writer used web analytics every month to track this, he could see — visually — how much his writing is improving. Crazy Egg’s scrollmap tool is perfect for this. Next we’ll review some of the best and most important web analytics tools and techniques used in the industry today. You will start to see how some of the data that once used to only be available to data scientists and engineers is now readily available to any digital marketer willing to invest a little effort to master these tools which range in cost from free to inexpensive. Campaign tracking is a method to help you understand where your traffic is coming from. By using special parameters in the URLs that link to your website, you can differentiate between them. By ensuring that all the links to your website in your email newsletter utilize URLs such as these you will be able to filter your Google Analytics data accordingly and differentiate between traffic that came from different sources, such as Google AdWords, Facebook Ads, newsletters, or anywhere you publish links to your website. Goals are conversions, which, again, are the most important metric for almost all businesses to track. Google Analytics allows you to define a wide range of things as goals, including “destination” (a specific page you want people to reach), “duration” (how long you want people to stay on your website), and “events” (such as a button click that doesn’t necessarily take you to another page). You can even assign monetary values to specific goals so your analytics mirrors your revenue. Here’s a great article on several important content metrics you can track. If you look closely, you can see that the suggested metrics there can be tracked as goals in Google Analytics. For example, tracking social shares. You can set a goal in Google Analytics to to equate clicking on a specific “share to Twitter” button, for example, as a completed goal. Later, you can filter all your twitter traffic (using campaign monitoring) and track how many people from twitter end up purchasing a product. With that data, you can then determine how valuable it was every time someone clicked on your “share to twitter” button. It may not be a totally accurate correlation, but an overall average, and having a monetary value assigned to key buttons and other CTAs on your site can prove to be very useful. Audience reports give you access to deep data on your visitors that would be difficult or impossible to obtain with only your own web server. With Google’s capabilities, you can see a variety of this data, including demographics, geo-location, and key browsing behaviors. You can even access specific interests tied to your visitors, which can be extremely valuable for advertisers. How Google obtains this data, and the full range of the data available, is explained here. 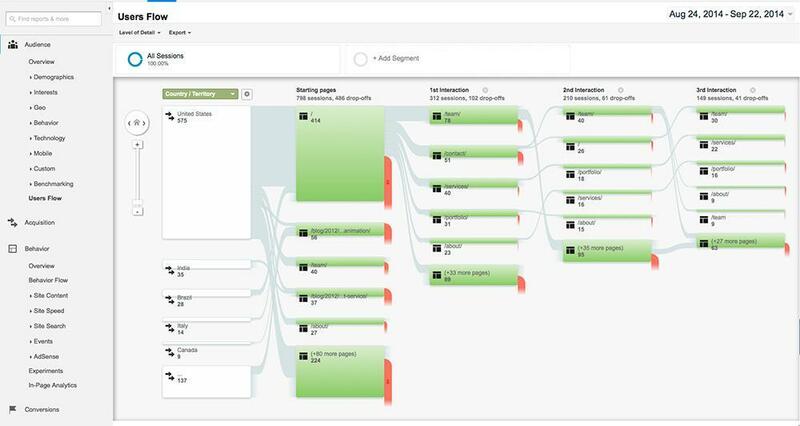 Flows are perfect for tracking your visitors through a funnel. You can see the path your visitors took from page to page on your website, including backtracking. There are several types of reports to emphasize different data from these flows. 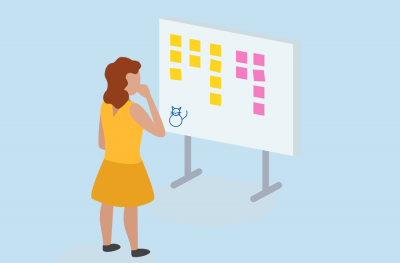 They are “Behavior Flow,” “Goal Flow,” “Users Flow,” “Events Flow,” “Funnel Visualization” and “Google Play Referral Flow.” More details for each are published here. For a more comprehensive look at Google Analytics, take a look at The 8 Google Analytics Features Every Site MUST Have Enabled. And here are Three Little Known Tricks to See Google Analytics Data More Clearly. There are many conversion testing tools on the market, but the best are usually paid and add to your marketing expenses. The one exception to this rule is Google Analytics. It’s very simple to use Google Analytics for A/B testing (the most common form of conversion testing) with two, or even multiple, variations in the website design. Here we will give you a step-by-step guide for easily testing your web page through a Google Analytics content experiment. 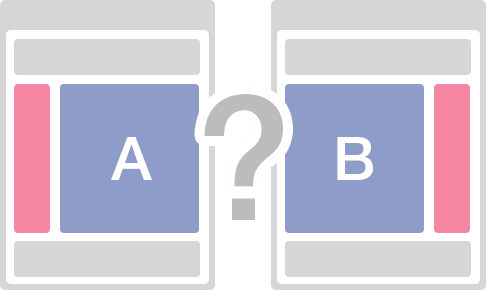 A/B Testing, also known as split testing, is the technique of using software to designate two versions of the same web page: version A and B. The software ensures that half of your visitors see version A and the other half sees B. Version B should then be modified with the intention that the modification will increase conversions. A simple example of this is to make version B have a “sign up” button with a different, brighter color and a larger font size. After letting both versions run for some time it will become apparent which version performs better, and the improvement can be directly attributed to the design change. At that point, you launch version B as the new page, sit back, and profit. Seems pretty simple, right? Wrong. Most newcomers to A/B testing struggle with which tools to use, how to set up their test, and how to determine when it’s complete. So we’ll show you a free tool, readily available to every website owner, as well as guidance on setting up your test and knowing when to call it done. 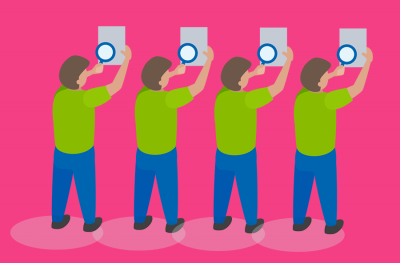 There are many things you can learn from an A/B test. It can be used to determine whether you should focus on single conversion goal or strive for multiple conversion goals. It can help you know which design elements and messaging are most persuasive for your audience. No matter what you’re testing, keep your priorities straight. The end goal of any CRO (conversion rate optimization) process should be to increase your total revenue. Imagine you’ve set up an A/B test to choose the best page design for increasing your subscriber rate. It works. Your subscription rate goes through the roof—but the design somehow hurts your sales rate and results in lower revenue. This might make you insane. Do you keep your winning design? No. Always choose the page that will increase your bottom line, not just your conversions. Remember, companies run on revenue, not on conversion rates. A conversion for a business could be anything. For bloggers, a single subscription could be considered a conversion. For eCommerce, a conversion might be a sale, subscription, newsletter sign-up, product carting, or even an event click. Before you can start conversion testing, you’ll first need to define what your goal is for each test, so you can accurately identify the winning page design. 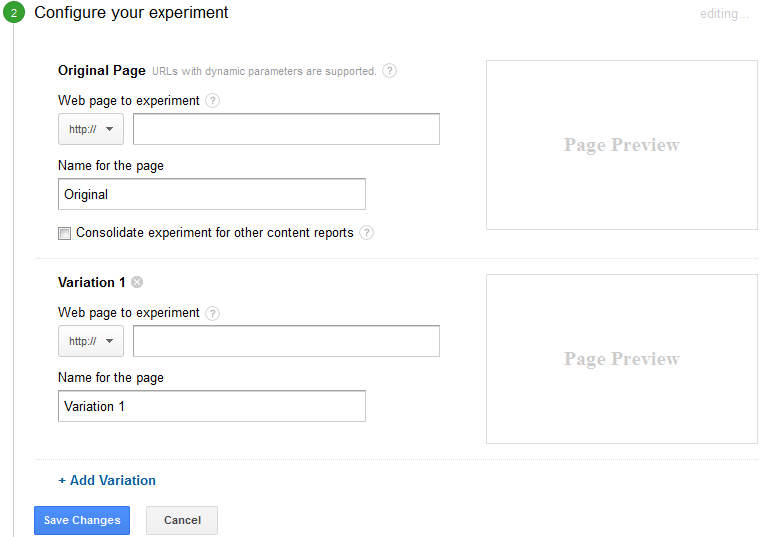 Google has combined A/B testing and split testing into one term — content experiment. You’ll be taken to a screen (pictured below) where you can set up your experiment. First, add in the experiment name. For instance, if you want to perform A/B testing for a sign-up form or product selling button, then create a descriptive name that makes it easy to identify the experiment. Under “Objective for this experiment,” you’ll define the metric you’ll use to evaluate the results from your test. Metrics can be chosen from Adsense, Ecommerce, Goals, Site Usage, etc. If you’re looking to improve ad clicks or impressions, then choose the Adsense option. If you want to boost revenue or the number of transactions, select eCommerce. If you have predefined goals like session duration, event attendances, or destination page clicks, then opt for the goal metric. Lastly, if you’re looking to better user experience through average page views or time on site, go for site usage. The best part is you can set multiple metrics at one time. Once you’ve set the objective, you can divide the percentage of web traffic for the content experiment. This will control how many people visiting your website will see one of your test pages as opposed to your original page. For quick results, you may want to include a high percentage of visitors in the experiment. However, if your experiment is rather drastic or risky, include only a small percentage of your website’s traffic. It’s also smart to turn on the email notification to stay updated on any changes occurring in the experiment. In the “Advanced Options” tool, you can control how to divide the traffic by turning on the “Distribute traffic” toggle button. Enable this option to assign an equal amount of traffic to each variation for the life of the experiment. If this button is left disabled, content experiments will follow the default behavior by adjusting traffic dynamically based on variation performance. From there, you should set the minimum experiment time at three weeks for the best results. 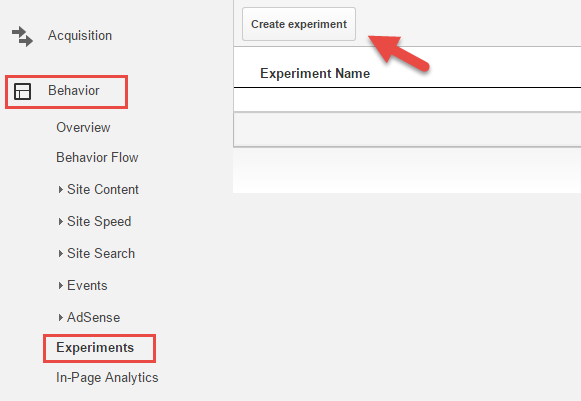 Google Analytics also allows you to fix the confidence threshold for your content experiment to determine the minimum confidence level that must be achieved before a winner can be declared. The higher the threshold, the more confident you can be that the winning web page has competed well against the other design. Keep in mind that higher thresholds can make your content experiment considerably longer as Analytics waits to crown a champion. Use this confidence calculator to determine your confidence threshold. The next step is to configure the experiment by adding in your original web page and your test pages. As you can see in the image below, you simply need to enter the URL of your current page and all variation web pages. Once you add the original and test pages, look over the preview image to be sure you’ve entered the right URL. Hit the “Save Changes” button after you check for completeness to head to the next experiment section. Now, you’ll need the experiment code for your testing project. 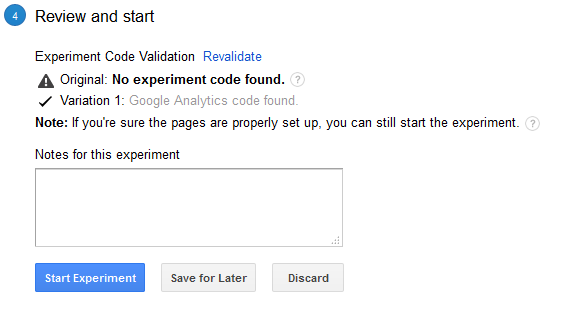 If Google Analytics tracking codes are properly installed on your original and variation pages, an experiment code will be immediately visible in the box. Place this code immediately after the opening head tag at the top of your original web page. Once it’s added, hit the “Save Changes” button again to progress to the final step. 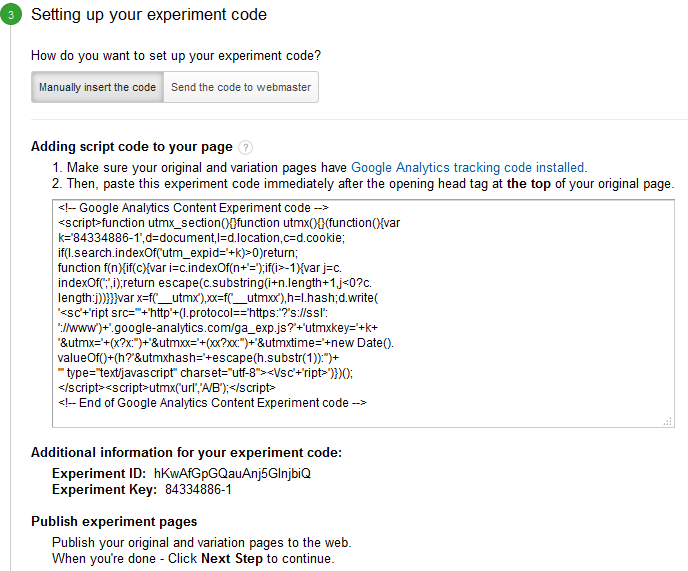 You can use the Google Content Experiments plugin to enter the code on your page. When you’ve added the code, Google Analytics will validate it and show any errors that have been encountered if applicable. Sometimes Analytics isn’t able to find the code. In this case, you can skip the validation phase as long as you’re sure the code was properly added. Google recommends skipped validation as only a last resort move. Instead, check your page for any errors that may have been introduced. Otherwise, you’ll be given the green flag to start your content experiment. Your experiment will launch and you’ll start seeing reported data within one to two days. After your experiment has run its course, Google Analytics will declare the winner based on your previously defined metrics and confidence threshold. It will take at least three weeks to reach this step. By reviewing your results, you’ll identify the page that performs the best. You can then publish this as the page you want viewed by all website visitors. Easy. But does it work? Kapitall increased conversions by 44 percent through A/B testing from a Google Analytics content experiment. So clearly it does. Overall, Google Analytics is a free tool that’s very easy to configure for running testing experiments because the search engine handles all of the dirty work. There’s one downside though. Analytics doesn’t support multivariate testing, which is a well-known technique for testing multiple variables like color, text size, and buttons all at once. Google Analytics can’t be used for an email campaign either. That said, it’s still the best option for running A/B testing on your landing page and conducting a content experiment at the very low price of free. 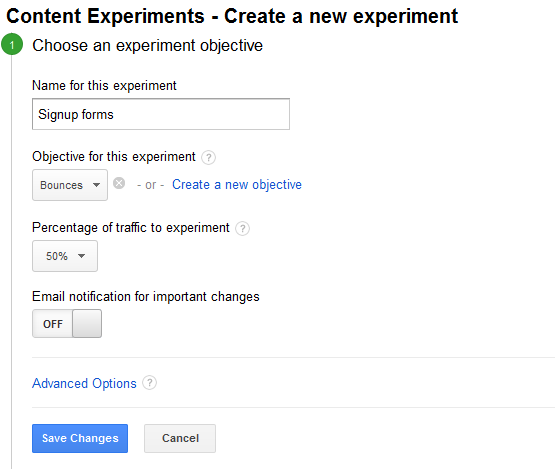 Have you used Google Content Experiments? What was your biggest win? Crazy Egg is the best and most affordable visual web analytics tools in the market. It has been around since 2006, and the software widely respected and trusted by the digital marketing community. The Heatmap report is Crazy Egg’s signature analytics tool. A heat map is a visual representation of data. Hidden on all your web pages, constantly accumulating and changing, are thousands of data points, including where people click (or tap) and what they click on — as well as at what time of day, using what browser, coming from what search engine, and much more. All of this data represents valuable insights with which you can use to improve your website’s success — and increase your revenue. Once you can unlock and visualize this data, like where your visitors click most (and where they fail to click), you will begin to see new opportunities to design more effectively, improve user flows, and apply optimizations that can dramatically raise your conversions and improve your UX. In the image above, the hotspots are the red and white areas where people are clicking on the most. If the buttons directly beneath those areas aren’t the most important or valuable things your users should be clicking on, then your website most likely needs to be redesigned to fix that problem. A very simple concept, but a very effective practice! User Recordings actually capture all of your visitors’ mouse movements from beginning to end. With User Recordings, you can actually watch the mouse movements of individual users as they navigate your site. Although reviewing several recordings can be a time-consuming task, doing so gives you invaluable insight into how your users behave. 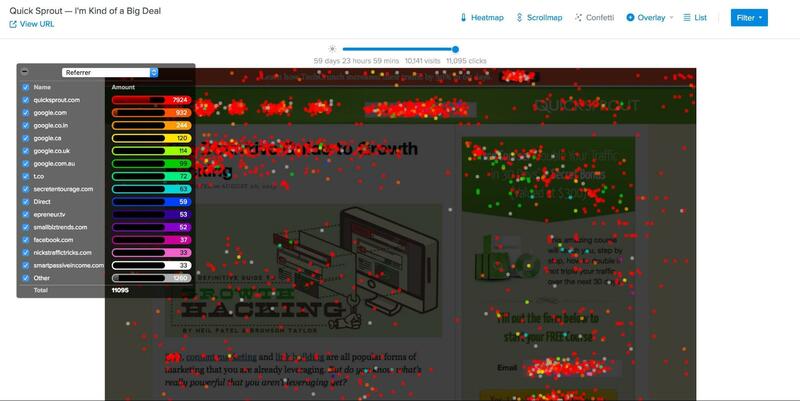 For example, even if your most important links are nicely highlighted in red in your heatmap, it would still be a problem if, on average, users were moving their mouse around aimlessly or in frustrating patterns before reaching those links. This type of problem can only be revealed by watching recordings. With Crazy Egg, that data is always captured for you. Crazy Egg takes digital snapshots of your webpages and generates easy-to-understand reports that display your visitors (and users) click behavior. You’ll learn a lot about your web design and how your customers interact with your page elements and layout. This is the key to unlocking page improvements that’ll increase your bottom line. Crazy Egg Snapshots are interpreted by several different reports, each providing a unique and valuable look at how your visitors are engaging with your webpages. The Confetti Report is a favorite among many, including Avinash Kaushik, one of the foremost experts in web analytics. Facebook offers a great tool for visualizing and tracking user interaction on your Facebook Pages, called Facebook Page Insights (or Facebook Analytics), and it’s free to use. While much more limited than Google Analytics in its feature-set, Facebook is a proprietary platform, and this tool is the quickest way to gain access to all your Facebook specific data. Check out a Beginner’s Guide to Facebook Insights to help you get going with their tool, and the official product info from Facebook. There are so many different web analytics tools that it would be impossible to compare them all in a simple way. Here we will compare the price and top features for the tools featured in this guide. There are several free web analytics tools available, and the king of them is Google Analytics. There is really no reason to not use it. It provides a wide array of sophisticated features that both beginner and expert marketers and web data analysts can benefit from. You can implement recommended successful web analytics strategies with it. Facebook Page Insights is also free, and much more basic in its capabilities, but clearly the direct choice to get data from the proprietary Facebook platform. Finally, Crazy Egg adds advanced visualization features to your web analytics stack at a much more affordable price than others in its space. Heat maps, Recordings, and A/B testing are crucial to improving the performance of your website. And of course, the major social and application platforms have paid advertising tools: Google Adwords, Facebook Ads, Bing Ads, Yahoo Gemini, etc. When using these services it’s important to know the strategies to optimize your ads and paid traffic. And don’t forget to learn from the best in the field! The number of options available to you in web analytics may seem daunting at first, but with continued usage, you will soon be creating expert level analyses yourself. If you haven’t done so, you should drop everything you’re doing and connect web analytics tools to your website today. It’s that important. Google Analytics is free, and Crazy Egg is free with a 30 day no risk-free trial.